This house is set up perfectly for everyone to enjoy all the creature comforts of a home and plenty of room to escape when the children want to play or quiet time is needed. The home easily accommodates two families or a group of up to 12 people. The kitchen is well appointed with a dishwasher, large fridge and ample crockery to cope with a larger group. 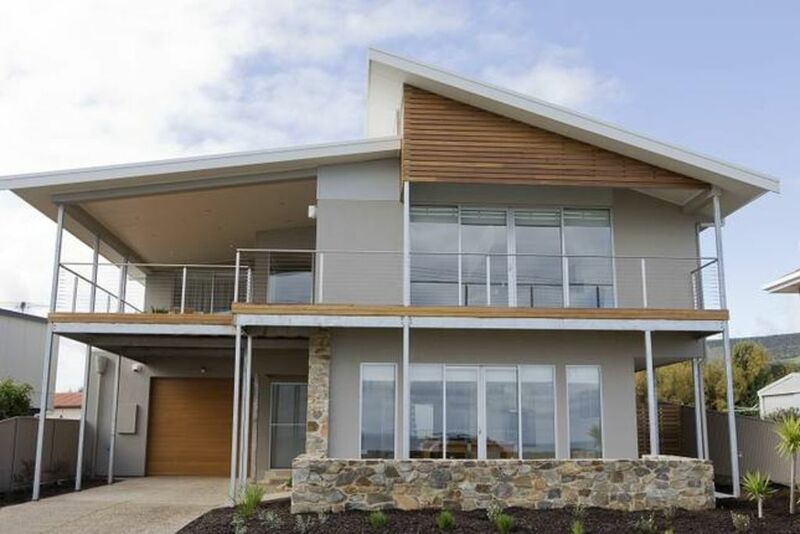 The views from the house are spectacular, the rugged coastline sprawls south to Myponga Beach and to the north, the gentle rolling waves break on to the white sandy beach of Silver Sands. The hills view to the rear is equally beautiful, a tapestry of grape vines, olive trees, native plantations and farmland roll down to the Gulf of St Vincent. Upstairs is the hub of the house, with a large living area with TV, dining area (seating for 10), sitting area, main bedroom with queen bed, WIR and ensuite, second bedroom with queen bed, adjoining guest bathroom, front and rear balconies with tables, chairs and BBQ. Downstairs includes two living areas one with a large pool table, one with kitchenette, TV, X-box and surround sound, third bedroom with king sized bed adjoining a two-way bathroom, fourth bedroom with 2 sets single bunks and 2 trundle beds, full sized laundry, 2 outdoor patios. A table tennis table is located in the adjoining garage. A simple sound system is installed throughout the living areas which only requires a device such as ipod or mobile phones with an auxiliary connection. A reverse cycle ducted air conditioner makes the home comfortable in both summer and winter. During the winter months the gas log fire creates the perfect setting to watch the storms roll in over the sea as you relax into the comfy leather couch with a good book, or sip some of our world class McLaren Vale wines. Access to the beach is just a 300m walk, the beach is safe for children and can be driven on great for beach cricket or a picnic, the water is crystal clear, the nearby reefs create good snorkelling, rock hopping, kayaking and fishing. Sellicks Beach is a great central location to explore the Fleurieu Peninsula Region with most attractions within a 50 minute drive including the city of Adelaide. A short drive to the quaint town of Willunga, reknown for its fabulous farmers market and is a great place to stock up on local produce for your visit. The McLaren Vale wine region is within 20 minutes drive and boasts in excess of 60 wineries, the area is well catered for with beautiful restaurants, cafes, galleries and wine experiences to be enjoyed. National Parks with great bushwalking are just a short drive away. Closer to home our local and famous Victory Hotel is just up the hill. Or of course, stay in and create your own restaurant experience and dine on the balcony with some of the most spectacular sunsets as you watch the sun melt into the sea. Bond is payable at the same time as the balance amount. The bond will be refunded within 7 days in full subject to the above conditions being met. It is designed to cover any additional costs incurred including but not limited to, any breakage, damage or excess cleaning requirements, extra guests beyond those declared ..etc. Linen is to be supplied by the tenant, or is available for hire at $30/person which includes sheets, towels, face cloths, beach towels and 2 extra tea towels. We had a fantastic time and will come back! The property is fantastic with everything thought of, great rooms, views, beach access and ... that view! The best beach house in Sellicks - superb views! Sea la Vie is the perfect beach holiday home for people looking to be close to Adelaide, on the doorstep of Maclaren Vale wineries, the best beaches on the Fleurieu, while looking to relax with friends and families. We had interstate guests and they were blown away by the location, and loved the sunsets (don’t get sunsets like this in Sydney!). The house is perfectly decked out with everything you need for up to 12 guests. We comfortably accomodated 10 for the weekend. The Victory hotel up the road is the cherry on the cake! Modern house with everything you would expect and then some. Lots of features to help you relax or have some fun with friends. Pool table, beanbags, gas fire place etc. A house with all fittings, appliances and equipment you could ask for, very comfortable and spacious, and wonderfully located for enjoying the sea, the beach, and superb views - especially the sunsets. Owner a delight to work with. Thankyou Paul for your great review, so pleased you had the opportunity to experience some of the fabulous sunsets of Sellicks Beach. We would love to have you and your family return again sometime if you're heading to SA. Sea La Vie is the nicest, cleanest, most-equipped house that we've ever rented. Great beach below and close proximity to world-class wineries, like K-1, Hardy's Tintara and many others in the Adelaide Hills and McLaren Vale. Thanks Glennis. Thankyou Mike for your lovely review. So pleased you enjoyed your stay and great to hear you took the opportunity to sample some of the fabulous wines of the McLaren Vale region! I hope you got to pop a few in your luggage to return to the USA! We would love to welcome you back again sometime. Best holiday house I've ever stayed in! Awsome house! Awsome veiw! Awsome stay! Highly recomend. Great to hear you enjoyed your stay at Sea La Vie and thankyou for taking the time to post a review.